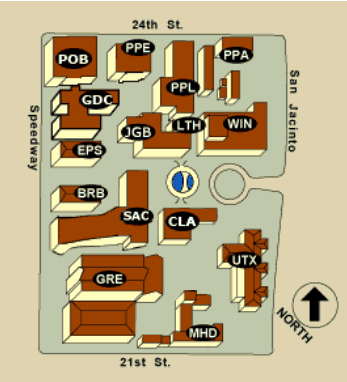 The SAC is located in the middle of campus at 2201 Speedway. The airport is in southeast Austin on Texas Hwy. 71, approximately eight miles from downtown. Discounted room rates for are available for $159 per night for September 22-24 if you book by August 22nd. From I-35, take exit 235A toward 15th Street, and merge onto the I-35 Frontage Road. Turn right onto East 15th Street and go 0.8 miles. Turn right onto Lavaca Street and go 0.6 miles. 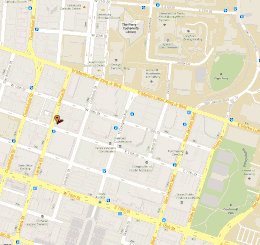 The hotel will be on your right hand side. Turn left onto E. Hwy 71 Service Rd. Take the I-35 N/US 290 E exit. From I-35, take exit 235A toward the U. of Texas/15th Blvd/Martin Luther King Blvd. Merge onto the I-35 Frontage Rd. Turn left onto E. 15th St., and then right on Lavaca. The hotel will be on the left. Brazos parking garage is at Brazos and MLK at 210 E. MLK. Take the Windsor Road exit, heading east. Windsor Road turns into 24th Street. When you reach Guadalupe Street, you are at the western border of campus. Make a right onto Guadalupe St., going south. Turn left onto Martin Luther King Blvd. The Brazos parking garage is at Brazos and MLK at 210 E. MLK. From the north, take MoPac/Highway 1 South and follow directions for MoPac/Highway 1 above. From the south, take Highway 111/Airport Boulevard North to MLK Boulevard. 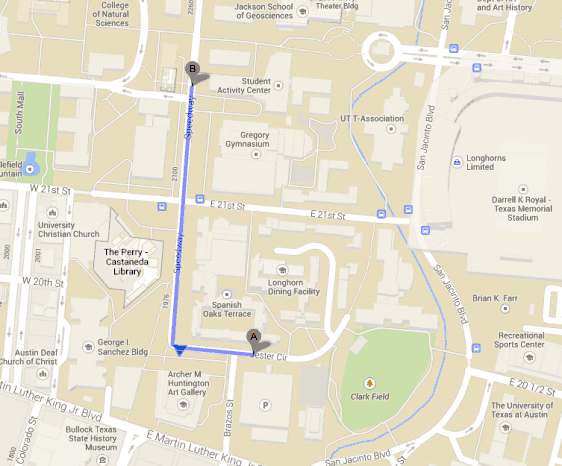 Head east on MLK Boulevard and campus will be on your right. The Brazos parking garage is at Brazos and MLK at 210 E. MLK. Turn left on to E. Hwy 71 Service Rd. Take the I35 N/US 290 E. Follow directions for I-35 above. To walk from the parking garage to the conference location (SAC), exit the parking garage and go north into campus on Brazos. Brazos will dead end into Jester Circle. Follow Jester to the left and then turn right when it turns into Speedway. The Student Activity Center (SAC) will be on the right, just past the intersection with 22nd St. The conference will be held in the 2nd floor ballroom (room 2.410) on September 23. Take Lavaca north to Martin Luther King Blvd. Make a right on MLK and go two blocks to the Blanton Art Museum (on the left, across MLK). 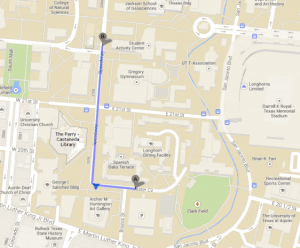 Make a left onto one of the walking paths, going north into campus. Both sidewalks will merge into Speedway. Continue north on Speedway. The Student Activity Center (SAC) will be on the right, just past the intersection with 22nd St. The conference will be held in the 2nd floor ballroom (room 2.410) on September 23. 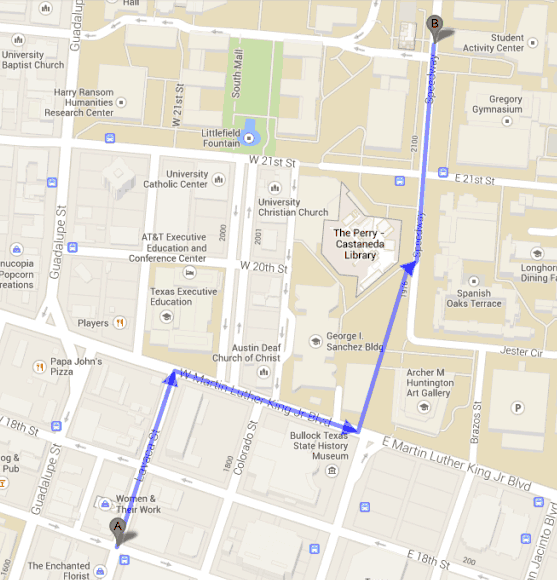 A shuttle will run between the Hampton Inn and the SAC at the beginning and end of each conference day. The shuttle will depart from the Hampton Inn at 7:45 am on September 23 and 24. On September 23, the shuttle will depart from the SAC at 6:35 pm to return to the Hampton Inn.